While it’s technically illegal for New York City residents to rent their entire place for fewer than 30 days at a time — room-shares and extended sublets are allowed — the city and attorney general’s office have insisted they’re not interested in small-time Airbnb-ers, but those using the share economy to become mini hospitality moguls. Their first targets: brothers Hamid Kermanshah and Abdolmajid Kermanshah, who own and operate a four-story building on Fifth Avenue and a ten-story building on West 31st Street. 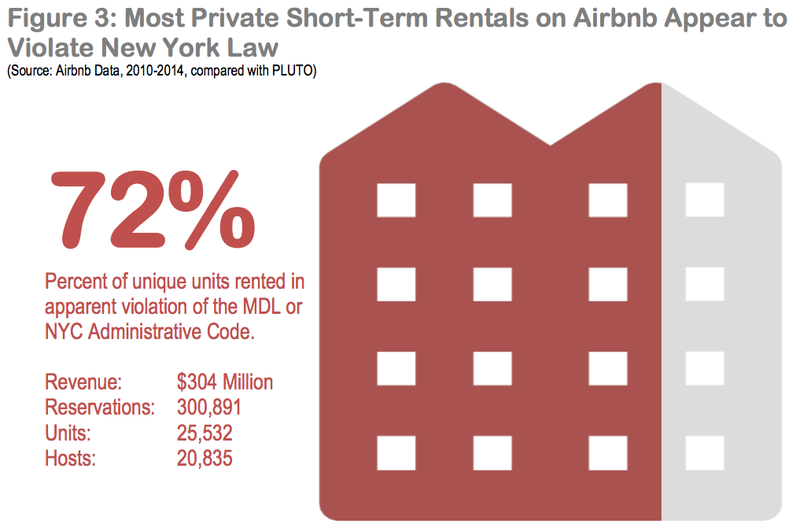 Airbnb, according to the AG’s [Attorney General’s] analysis of 497,322 transactions for stays between January 2010 and June 2014, is largely illegal, hugely profitable, and quickly consuming lower Manhattan. Rather than helping the average New Yorker make ends meet, much of Airbnb in New York City is making money for a small number of commercial hosts running large, multimillion-dollar operations. For business travellers there are obvious benefits. Booking may be less convenient than for hotels and prices are not always lower, but travellers benefit from more choice and, usually, space. For more seasoned road warriors, Airbnb’s varied portfolio makes a refreshing change from the depressing homogeneity of hotel interiors. But even as Airbnb claims victory in its home city the honeymoon period may be coming to an end. … Part of the problem is the gold rush Airbnb has prompted. What began as a platform for homeowners with spare rooms to make a bit of pocket money on the side, is becoming overrun with property entrepreneurs looking for lucrative short term gains. The market is also getting more crowded with competition coming from upstarts such as Roomoramaand HomeAway. Meanwhile success breeds exploitation. From trashed properties and wild parties to a multitude of scams, there are plenty of Airbnb horror stories circulating to put off prospective tenants (and landlords). I love the sharing economy — what’s not to love about taking underutilized assets and making them more productive? But Airbnb has an almost uniquely difficult task in converting rooms to a permanent revenue stream. Most people are more sensitive about what happens with their homes than they are about what happens with their cars, bikes, or designer handbags. That may be particularly true in the dense, expensive areas where Airbnb is most in demand — though to be sure, I’ve also heard people in single-family home neighborhoods complaining about the potential for rowdy house parties. Whenever a new market opens, there’s a sort of wild west period when gaps in the law allow people to make a bunch of money. Over time, however, legislators and regulators wake up, and start laying down the law. Entrenched competitors are protected, numerous interest groups are given concessions, fees are tacked on. The end result is greater certainty, but lower profits and innovation. [Q] Politicians like Rand Paul are seizing on young people’s embrace of companies like Uber and Lyft and Airbnb that are disrupting heavily regulated industries and saying, “You know, if you’re frustrated about Uber, let me tell you about these other regulations that are terrible.” Are these companies breeding a new generation of libertarians? Previous Dish on Airbnb here and here. Next Next post: Apprenticeships: Lost In Translation?